Curly hair. It's the best/worst thing. Everyone says they want it and they wish they had that much volume but...do they really?! My hair has been something I've battled with, and continue to battle with to this day. I thought by the time I was an "adult", I'm 26, I'd have it all figured out. I have kinda figured out my routine ..but it is either a sock bun or down and wild n' curly. I'm always on the hunt to find new products to make my life a little easier, add moisture and reduce frizz. 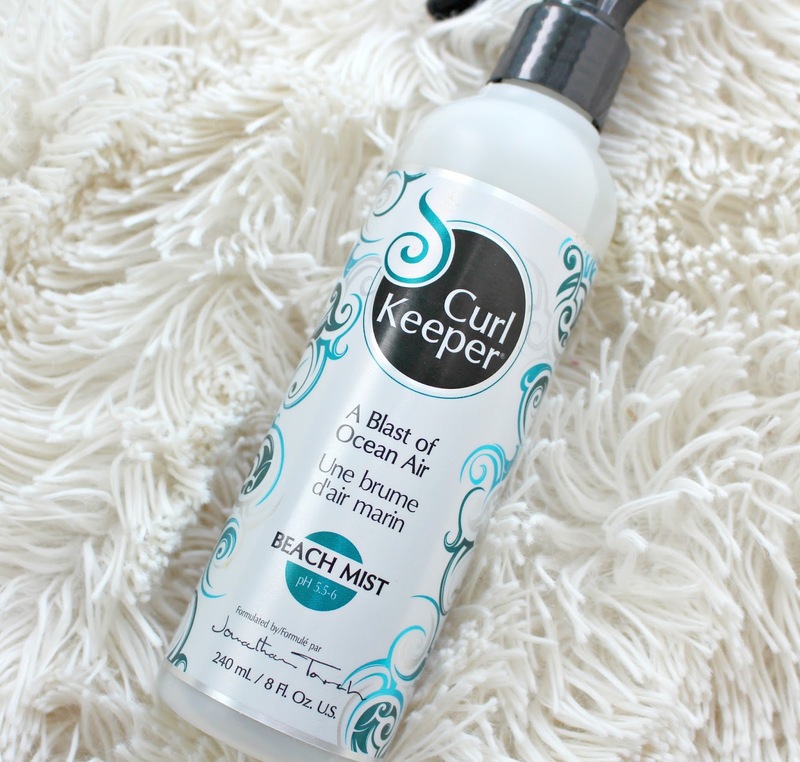 I was super excited when Trade Secrets reached out to me to try the Curl Keeper line. 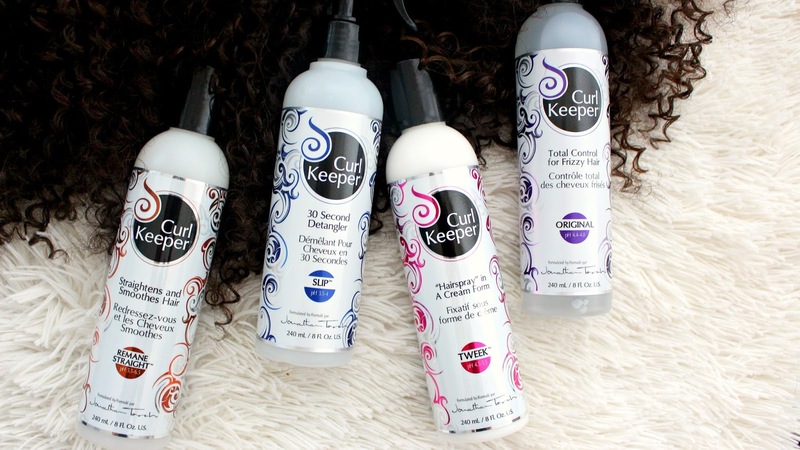 As an added bonus, Trade Secrets is offering a free Curl Keeper deluxe sample with a $25 purchase of anything in the line! I had never tried this line previously but anything that is directly marketed towards curls is always intriguing to me. In doing my research I discovered this is actually a Canadian brand out of Toronto which makes it that much more exciting. If you're curious about all things Canadian I have a Canadian Beauty Series on my YouTube Channel. For reference, my hair is colour treated and relaxed but I wear it curly. I try to keep the use of heat to a minimum. I'm not sure what curl pattern I have, it is a little all over the place. I'm working on undoing a lot of damage from wearing it straight for too many years. 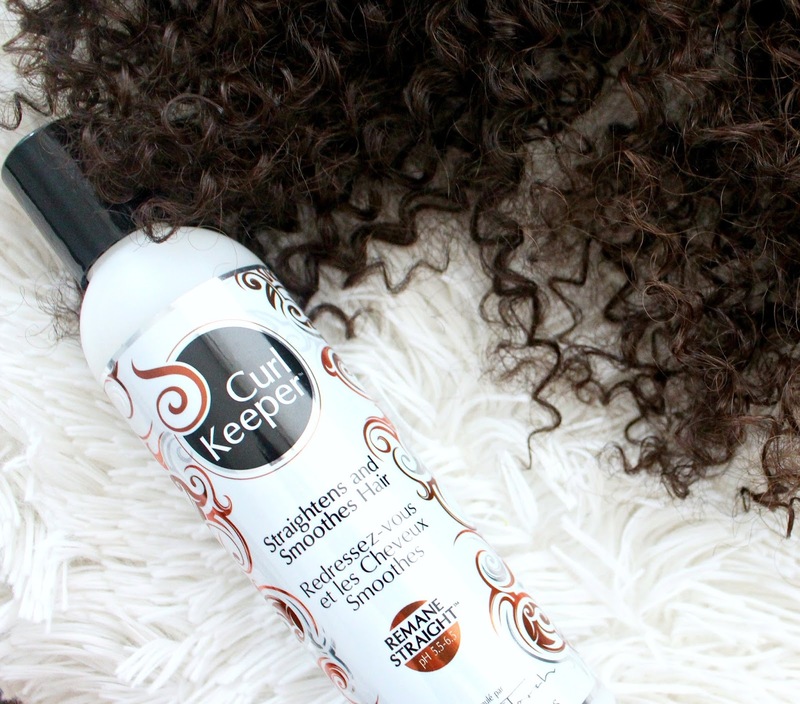 Curl Keeper has a water based formula free of silicone which is great if you are looking to avoid build up on your hair. Silicones mimic the look of shiny, frizz free hair but in reality your hair is no healthier. It's like concealing a blemish, you can't see it but that doesn't mean it isn't there. This line is also incredibly affordable too! Treating your hair well can sometimes seem like an expensive endeavor but Curl Keeper products retail for much less than your average salon products. A water based formula, containing no silicones with a pH of 4.5. Created to control frizz without further drying the hair and adding definition to your curls. Best used on wet hair. Try not to move your hair too much after application for about 15 minutes to let it dry and set, this will help reduce frizziness as well. I really enjoy this product because unlike many other frizz reducing products this feels thin and not sticky. Many products similar to this can have a very thick, gooey texture. This slides through the hair and does not weigh it down. It leaves my curls defined and not crunchy. I still have trouble managing my second day curls but it claims to be reactivated with water to help with the longevity of your style for several days. Formulated with 84 trace elements that are brewed from Pink Himalayan Crystal Salts. These salts work like electrolytes to draw moisture from the air to your hair, to moisturize and create volume. Best used on damp hair, followed by a diffuser or air drying to leave a voluminous finish. I'm not gonna lie, I have never purchased a beach mist, salt spray or anything of the sort in my life, they scare me! However I think my mind has changed. I blindly assumed that salt in my hair would dry it out worse than it already is, I also have no problems achieving volume. However I like to use this at the end of my routine, even though it suggests otherwise. Once my hair is mostly dry I will spritz it through to give it a little extra "fluff". I also like to use it on day 2 curls weather I am attempting to wear it out and curly again, or to help slick it back into a bun. Again, formulated without silicones and a pH of 4.5 to 5.2. 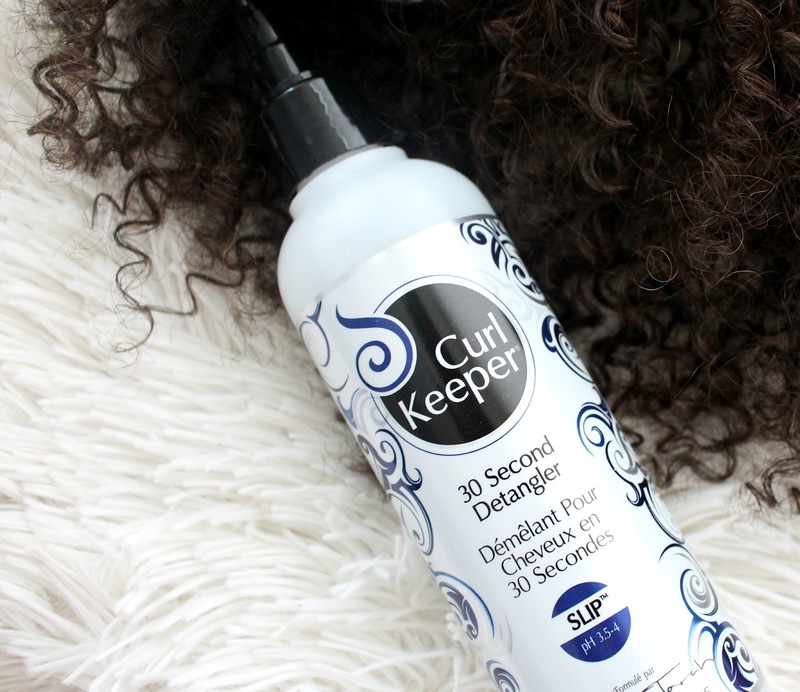 Curl Keeper Slip has been created to loosen hair knots, lock in hair colour and eliminate flyaways. There are conditioning ingredients that will leave your hair feeling soft and looking shiny without over-moisturizing. Slip will shut your hair cuticle so it works well to be used just after colour application. Recommended to be sprayed onto clean wet hair, wait 30 seconds and then comb from ends to roots. I love this! Again another super lightweight product that makes my hair routine that much easier. I personally don't detangle my hair out of the shower. I do it while my hair is still wet, loaded with conditioner and using my Tangle Teezer. However I love to use this out of the shower to add light moisture to my hair, to help control frizz when slicking back into a bun, or on second day curls to refresh them. It never overloads my hair with product, weighs it down or makes it crunchy. The way it sprays out of the bottle distributes just enough product too.This is something I can see myself repurchasing over and over again. "Tweek is a styling cream that does for curly hair what hairspray does for straight hair". Formulated without silicones and alcohol it does not further dry out the hair or create any build up. It allows you to not only style your hair but also bring back any bounce or smoothness you lost. Because curly hair does not do well with hairspray, oils and pomades this will act as your refresher to ensure your styles last and can be brought back to life. I haven't reached for an actual hairspray since my hair was straight so this has been a super interesting and helpful product in my routine. I love using this on my curls in combination with the Original formula. Between the two of them my hair looks voluminous, frizz free and it does not feel crunchy. It is also great when I want to style my hair in a bun or pony tail to ensure there are no unruly bits, and I can use a few less bobby pins. A non-chemical hair relaxer that helps to straighten and smooth curly hair. It seals the hair cuticle and prevents the hair from stretching/breakage, reduces frizz from humidity and leaves the hair feeling cleaner for longer lasting styles. Formulated with extracts of oat straw, chamomile, sage and nettle to protect the hair from heat damage. I cannot totally attest to the straightening properties, I don't even own a flat iron anymore and only reach for my hair dryer about once a week. I'm on the road to recovery after flat ironing my hair for 10 years straight. That being said I use this product when I rock a sock bun, which is A LOT. It helps to slick back my hair so that it looks smooth. I'll report back if I pick up a flat iron and straighten my hair. If it is anything else like the other products I used I can only assume it's fabulous. Overall, I think you know I am totally loving these products. It is only in the past 4 years that I have begun to fully embrace my curls. I'm still learning how to style and take care of them but Curl Keeper is something I can see incorporating into my routine moving forward. Sponsored post or not, I truly love the Slip and see myself buying that again and again. I also want to try their Leave-In Conditioner and Ultimate Gel. *This post is sponsored by Trade Secrets. All opinions are my own and honest! Great review and comments. I am a curly girl myself (perm free for 10 years now). I permed and straightened my hair for almost 20 years, so I understand the struggle 😉 I am always on the hunt for good products. I wear my hair in a lot of twist outs and wash n go styles. Sometimes I wear a puff with a nice scarf. I will have to give these products a try. I live in the US, so I get a lot of my products from Target, Sally's Beauty Supply, and sometimes Walgreens.